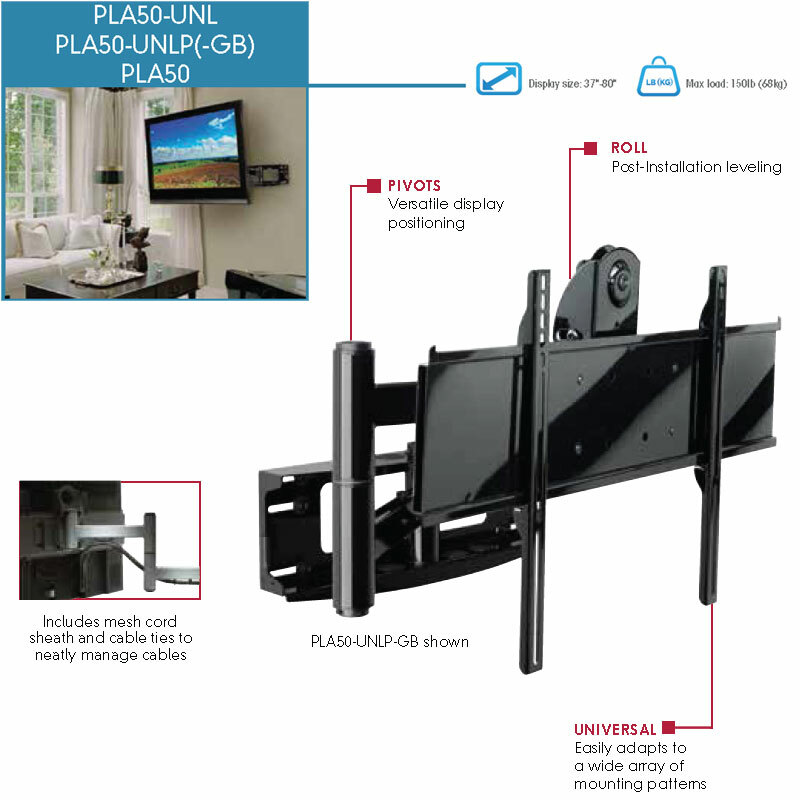 More on the Peerless Universal Articulating Wall Mount for 37-80 inch Screens (Black) PLA50-UNL below. Call our Peerless AV experts at 800-807-1477. 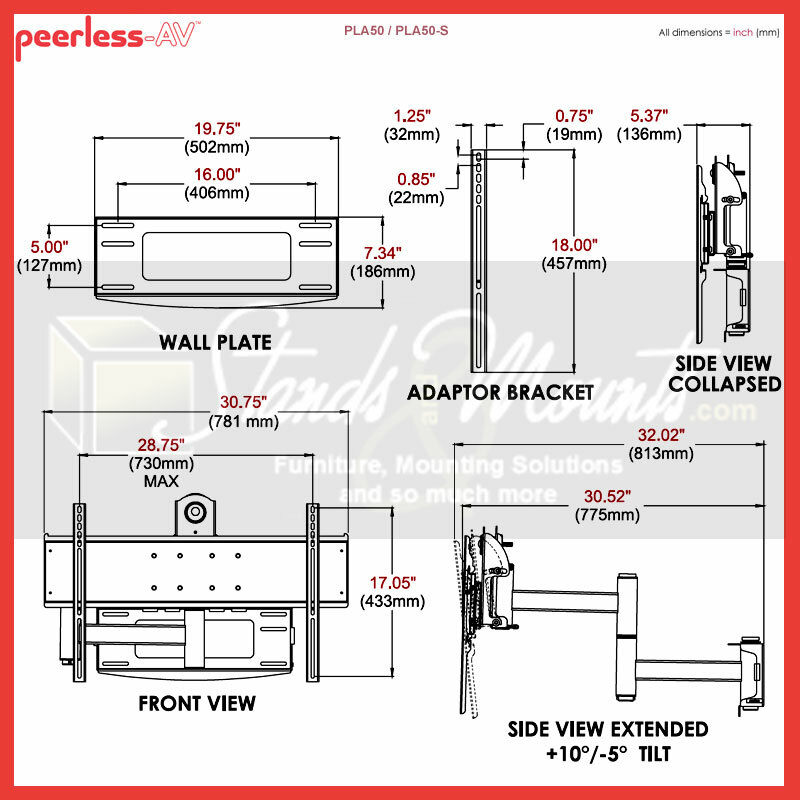 A universal design, mounting any 37-80" flat panel screen with mounting patterns up to 730mm x 433mm. Self-lubricating bushings for smooth articulation. A single articulating arm with 3 independent pivot points for 5.1-30.5" extension from the wall. Up to 180° swivel, depending on screen size. ±7° leveling range for post-installation horizontal adjustments. Included mesh cord sheaths and cable ties for tidy cable management. A scratch-resistant, fused epoxy finish available in matte or high gloss black. 37-80" flat screens up to 150 pounds with mounting patterns up to 730mm x 433mm. Please use Peerless' Mount Finder tool to select the appropriate model for your screen. Sound confusing? Call our Sales Team for help! Range of Screens Supported: 33 to 38 in., 39 to 42 in., 43 to 50 in., 51 to 60 in., 61 to 70 in., 71 to 80 in., 81 to 90 in.